ONE LAST CHRISTMAS CARD WITH HEARTS COME HOME – AND A HAPPY CHRISTMAS! It’s my last Christmas share today. I made this one a couple of months ago. So it is about time to share it with you. This one I Cased from my friend Leonie who I think Cased it off Pinterest. I have seen it on Pinterest anyway. It uses the Hearts Come Home stamp set and the Hometown Greetings Edgelits. The little houses were cut from Whisper White and adhered to a Night of Navy diecut circle. The Circle is layered on to a Silver Foil Scallop Circle. Both are cut from the Layering Circles Framelits. I had heat embossed Santa and his reindeers in Silver Embossing Powder too. The Night of Navy card strip was embossed with the Softly Falling Embossing Folder and I added some Silver Foil Strips underneath the piece. After wrapping around some Silver ribbon I adhered the piece on to a Whisper White Card mat that I had heat embossed the sentiment in Silver. It was all adhered to a Night of Navy card base. There you have it, Christmas creating is done. I am looking forward to packing all the Christmas stamps away and now turn to the new Occasions Catalogue. I can’t wait to play with some fun new products coming out. Watch this space for more. For now, I wish you a very Happy Christmas. Thanks for stopping by. I hope however you spend Christmas the time is full of happiness and joy. Perhaps you can take time to remember the greatest gift we have received – and it is not found under the tree. It is one of Hope and Grace so freely given to us. cards, Christmas, Classes, Stampin' Up! TAG TIME CLASS. LAST ONE FOR THE YEAR! Just a quick post for you today. Wollongong Peeps! If you still need some Christmas tags for your gifts then stop by this weekend. Make as many tags as you like in the time. I will have a few samples you can copy or create your own with the papers and embellishments I have out. Let me know by Thursday. 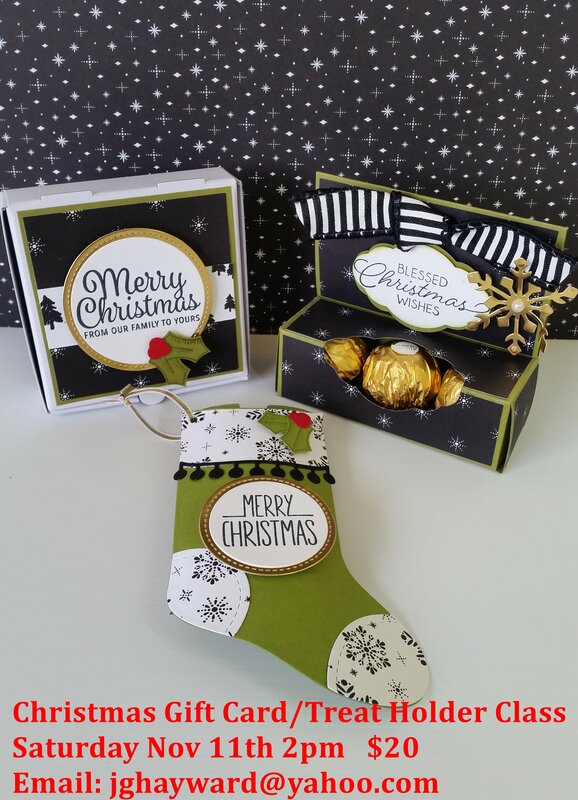 CHRISTMAS GIFT CARD/TREAT HOLDER CLASS! Christmas is coming! Now is the time to start thinking about gifts for family and friends. Sometimes these gift ideas can be difficult right!! Gift cards are always a great gift and why not dress them up fancy. This Saturday’s class is all about that. If you are not local to the Wollongong area you can get the kits for these projects sent directly to you. Here are the details. We have 3 very special gift card holders/gift boxes for you. COST: $20 Includes all materials. NB: Chocolates are not included. Patterned paper may vary. Please RSVP: Thursday 9th. Book early as seats are limited. Places are filling already so reserve your seat now. Can’t make it or you would like an additional kit to make later?? Kits: $20 each (plus postage). Australia residents only. Includes all materials to make the 3 projects excluding the stamped images. I have been playing with the Eclipse technique recently. You can see one of them a couple of posts back I made for a colour challenge. This one is a Christmas one using the Christmas Pines stamp set. The base card is Cherry Cobbler and the card mat is Crumb Cake. The pine leaves are stamped in Garden Green. The Gold Foil bow is cut from the Pretty Pines Thinlits. Have you tried the Eclipse Technique yet. SO easy but so effective. 1. Stamp your card with your chosen images. You can use a piece of Designer Series paper (patterned paper) too as an alternative. 2. For this card I used the Large Letters Framelits to cut the word out of the white card. You can use any dies though to cut other shapes from the stamped white card or paper mat. 3. Adhere the stamped white card mat or patterned paper piece directly on to your Crumb Cake card mat and then adhere both to the Cherry Cobbler card base. 4. Raise each letter up off the card in its place with Dimensionals. NB: I have seen on some tutorials that the letters were cut several times from white card. Then the cut letter was stacked up and adhered together and then the stamped letter was adhered on top of that stack. I don’t think that is necessary. Raising up the letter with Dimensionals is quite adequate. Now you can go and create your own Eclipse card. Thanks for looking today. I hope your day is going OK? ?